Alarm goes off at 6:30am, but I’m really already awake. My legs are sore. I get up and head over for oatmeal and juice. I don’t really want to choke down another rubber egg, but I do anyways cause it’s good for me. I reward myself with a toaster waffle and head back to the room to stretch and kit up. It’s a 45 minute drive to Big Pine and the start of our final Monster – climbing to Bristlecone Forest. 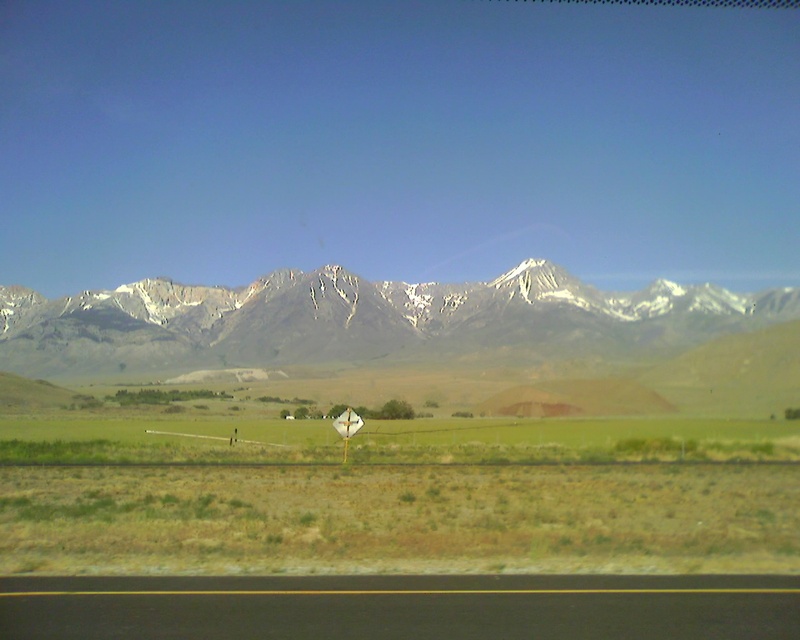 Looking out the window at the Sierra, I was filled with glory for the mountains. 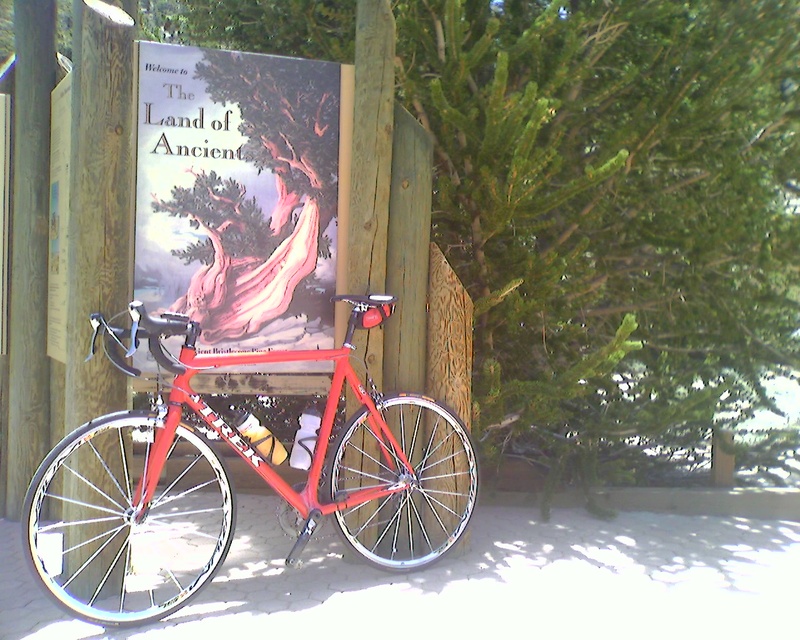 The climb to Bristlecone Forest is a real doozy. It’s 23 miles long and gains well over 6,000 feet before topping out above 10,000 feet. As Voris put it the night before, it starts out steep and only gets worse. I think this sign best sums it up. The lower part of the Bristlecone is a really pitchy and twisty. We tried to memorize the corners for the descent and even kicked a few rocks out of the way to make it safer later on. I was really hurting. My legs were sore from the previous day’s adventure and I was waiting for my form to catch back up to me. My heart felt good and I was confident that good form would find me farther up the road. So I hung out in the back of the group and gobbled down GU like it was going out of style. After lunch, the group toodles together along a flat section rewarming our legs in preparation for the final 3,000 feet of climbing. Voris has been complaining all morning about his knee and I’ve lectured him on how long it can take to heal a tendon or ligament injury. He’s taken meds and rubbed blue gel on his knee and had even iced it in the car on the drive over. But when he gets a little ahead of the pack I pop up there cause you still never know, right? I ask him, “Hey, are you on a 9 mile breakaway or something?” and he replies, “No, I just want to spin and warm up my knee after stopping for lunch”. Alright, I wait up for the pack… and didn’t see him again until the summit! Apparently his knee felt better and off he went. Congrats to Voris, he ended up topping out just behind Drew. It’s probably best that I didn’t try to stay with Voris because I did not have the legs. Once back on the climb proper, Boyle got a little ahead of me and I tried to catch him. I worked hard but the gap seemed to just get wider. I tried to power through the steep inside part of each switchback turn in an effort to gain some distance, but he went farther and farther away. Pretty soon my chase developed into survival mode. The situation was devolving into suffering. I turned over the cranks as best I could and when my legs refused, I ordered them on some more. It’s strange to look down and see yourself not pedaling and think, “Hey, who stopped the pedaling?”. I picked a point in the distance and said, “Just get there” and before I got there, I picked a new point. Over and over until I was topping out and there was Voris, cheerful as ever. Waiting to welcome the team to the top. We rolled over to the visitor center and I immediately laid down in the sunshine, flat on my back. Happy happy happy. Drew had been the first to the top, then Voris, and then Boyle. The rest team came trickling in and pretty soon we were all laying out in the sun, joking and enjoying more tourists who wondered if we really rode our bikes to the top. With no reason to leave we hung out and had a good time. We had climbed 23,000 feet of elevation, on 4 of the top 10 Monster climbs in the US in just 3 days. It was possible after all. Now the dessert. The descent from Bristlecone was the best of the whole trip. The upper section is a little gravelly, but the lower section is just pure Descender delight. I was feeling good and even managed to stay within sight of the rest of the team down the mountain. I was traveling close to 50 mph on the straights, ripping over rises that give you that empty stomach feeling before braking and diving into sharp corners. Down and down we came, ten Descenders having the time of their lives. It’s good to be a Descender. In the car, on the way back, Guido, Jim and I reflected on the weekend. We considered ourselves lucky to be able to take part in epic adventures like the Monster Climbs weekend. But even more, we’re fortunate to be able to have the epic adventures with a great group of guys like the Descenders. A team of guys who want to play hard and support and challenge each other. We’re out for the team win and we’re going to have a hell of a good time along the way. It’s all downhill from here. Thanks guys for a great weekend! Great blog! Can I ask a question? I’ve done Horseshoe too and was scared to death of getting a heat flat on the way down. Did you guys have any on your climbs? Did you run less psi in your tires? If so, what was it? Of all the climbs, which was most difficult? Thanks!!! I run standard Conti tubes mostly, the ultralight ones seem like they might be puncture prone, but I dunno. I have some friends who’ve done the Death Ride, but not me. We use this book The Complete Guide to Climbing (by Bike) which lists the top 100 climbs in North America. The climbs we did on our Monster Climbs trip were #4, 5, 7 and 9. You’ll notice that Onion Valley is the cover shot. Highly recommend the book, btw. Previous post: Yeah, that’s the point.